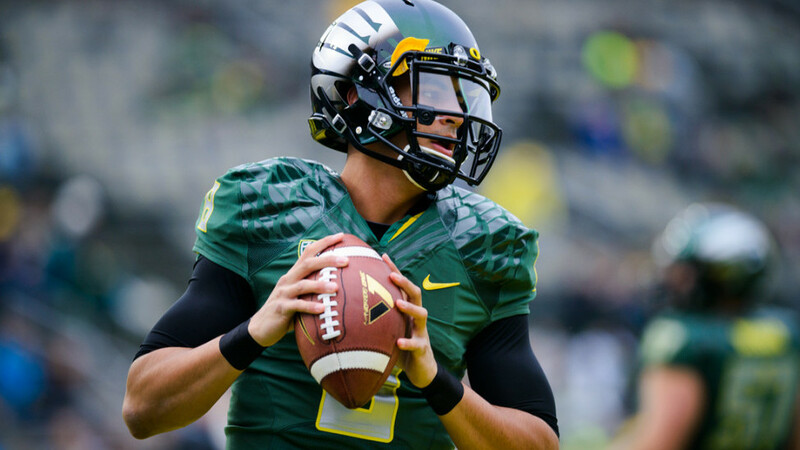 The San Diego Chargers will hold a private workout for former Oregon quarterback and 2014 Heisman Trophy winner Marcus Mariota on April 15, according to College Football 24/7. Mariota is ranked as the No. 2 quarterback by most draft experts behind former Florida St. quarterback Jameis Winston. To draft Mariota the Chargers would more than likely have to trade up from their No. 17 slot in the 2015 NFL Draft. Rumors of the Chargers trading up for a quarterback, like Mariota, have swirled since Philip Rivers candidly expressed his interest to not move his family to Los Angeles in an interview with U-T San Diego. Rivers has been documented as serving as a mentor to Mariota, making it possible that the team could draft Mariota and have Rivers groom him as the team’s quarterback of the future. Rivers’s contract is set to expire at the end of the 2015 season and according to the interview with U-T San Diego he has not been in talks with the team about an extension yet.